The Springfield Township Board of Trustees holds Regular Meetings at 5:30 p.m. on the second Tuesday of each month in Township Civic Center at 9150 Winton Road. These meetings are recorded and shown live on Waycross Government Access, channel 23 on Time Warner Cable and on channel 853 for Cincinnati Bell Fioptics subscribers. 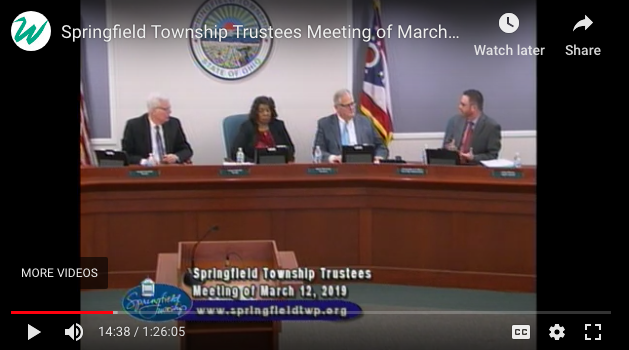 Meetings can also be watched live from the Springfield Township web page at https://www.springfieldtwp.org/283/Watch-Trustee-Meetings. Past meetings and township programming by Waycross Community Media are available anytime via Video on Demand from the same web page.